I’ve written before that thrash is one of my least favorite genres of metal. It’s not that all thrash puts me off, but for some reason the thrash bands who really get me excited tend to be fewer and farther between than bands in certain other metal genres. I think part of the lack of attraction is the traditional vocal style. I like thrash riffing, but not thrash screaming. What I’m discovering, however, is that black thrash tends to hit my sweet spot, particularly when it’s especially filthy and infernal. I like the ugly, glass-scraping vocals; I like the tremolo drilling; I like the dirty distortion. 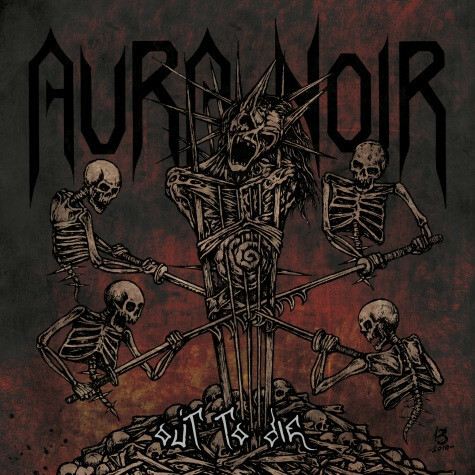 While we’re on that subject, I also like what I’m hearing from the new album by Norway’s Aura Noir. They were formed in 1993 by Aggressor (also in Virus) and Apollyon (also a member of Immortal) with the goal of incorporating influences from bands such as Slayer, Sodom, and Kreator into black metal. Their first official release was the Dreams Like Deserts EP in 1994. Later joined by guitarist Blasphemer, (ex-Mayhem guitarist Rune Eriksen, who now also leads his own band Ava Inferi), they’ve created four full-length albums, though the last one (Hades Rise) is now four years old. The next album, Out To Die, is scheduled for release on March 23 through Indie Recordings. Today Terrorizer premiered a song from the album called “Fed To the Flames”, which follows an earlier premiere by Brooklyn Vegan of a track called “Abaddon”. You can hear both of them after the jump. The production on the songs isn’t as raw and filth-encrusted as I might wish, but man, the riffing is blistering and bloody, the solo’s howl, and the rhythms gallop like demons on horseback. Ugly vocals, too, which of course is another plus. Enjoy. Im in the same boat when it comes to traditional thrash. The riffs are great, but the vocals have never done it for me…they just never seem to quite fit the music. Definitely gonna check this out. I just hope it will be better than Hades Rise. Raging. I grew up on “traditional thrash”, and still enjoy it for more easy listening moments, but I agree that blackened thrash truly takes the goat-shaped cake. And unlike both progenitor genres (black metal and thrash), blackened thrash isn’t totally oversaturated (yet).